Hence, when a Chef names a restaurant after the pursuit of craft, Shoushin translates to a Chinese phase signifying ‘a craftsman’s heart’, you know to expect a high caliber. Undeniably, my new found appreciation for the raw dishes have been cultivated after eating the real thing. Dining from the hands of a craftsman isn’t cheap, but just like having a fantastic steak, a good sushi meal should be reserved for special occasions. Like other high-end sushi restaurants, Shoushin’s offers only omakase menus that changes based on ingredient availability and the chef’s whim. As a diner, you simply pick a price point ($80, $130, $160 or $250) and inform them about food allergies. Wanting to try their sashimi, we opted for the Yuri ($130) menu. Consisting of two appetizers, sashimi, soup, sushi and dessert, it allowed us to sample a bit of everything. 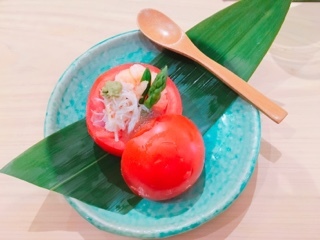 The first appetizer, a tomato pod, showcased the artful plating that synonymous with Japanese cuisine. 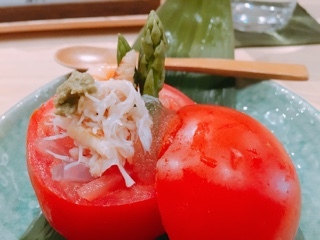 After the tomato’s juicy pulp is hollowed out, it’s used to make chilled agar-gar jelly noodles (a gelatin derived from algae). Topping the slick noodles were succulent pieces of East Coast Canadian crab; a dollop of tomalley added an extra richness. Completing the dish were cold asparagus and ponzu jelly, which made it a refreshing summer starter. 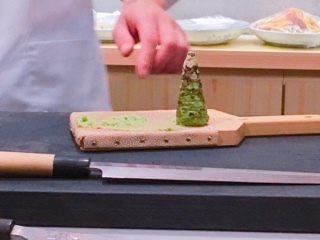 As the grating board was revealed and the wasabi root prepared, the anticipation started to build. We’re warned that the prized condiment shouldn’t be mixed into the soy sauce, instead you add a bit to the fish and then dip into the soy separately. With bits of a chopped herb (could be shiso) topping the fluke (hirame) it was light and refreshing, slowly easing my taste buds into the meal. 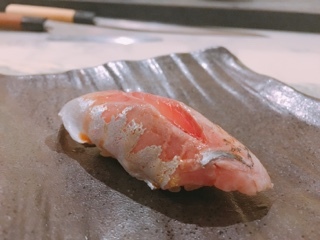 The amberjack (kanpachi), while still delicate, had an almost creamy finish that’s really different from past experiences. Although I couldn’t catch the Japanese name of the smaller fish, I could have sworn it was described as “chicken fish” in English. If it were, I could see how the name was derived as the fish’s skin had the chewy springy texture of a cold boiled chicken. What a shame that there was such a small cube of the octopus. The tentacle was so flavourful and tender that I immediately wanted another taste. 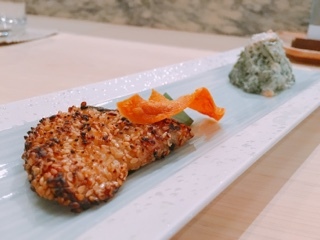 Following the sashimi was a hot appetizer: a lovely sesame encrusted miso marinated black cod – just as flavorful and moist as the typical grilled version, but with a nutty crunch from the sesame coating. On the side, a pyramid of crown daisy vegetables, shredded carrots, and shiitake slivers mixed with tofu paste. I could have done without the side of vegetables as there’s a unique taste to the chrysanthemum greens that I’ve never acquired (also known as tung ho, it’s also frequently found in hot pot restaurants). Before the sushi, a rich bowl of hot miso soup was presented. 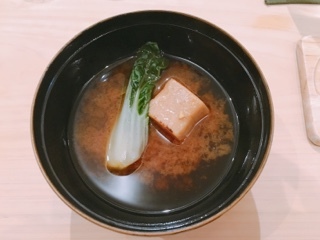 Earthier than the typical salty broth, it went nicely with Shoushin’s take on agedashi, which was was mixed with a glutinous flour so that the tofu had a chewy nutty bite. Lastly, ten pieces of individually prepared sushi to finish off the meal – you will not leave hungry. Before getting into the heavenly ending, I must commend Shoushin on their overall client experience: their service attentive and friendly, but also incorporating small touches to ensure everyone is comfortable. For example, diners are presented with a thick wet napkin to wipe their fingers on after picking up the sushi, if they feel uneasy using their chopsticks to get the sushi from the counter (even I had to resort to picking up the red snapper). 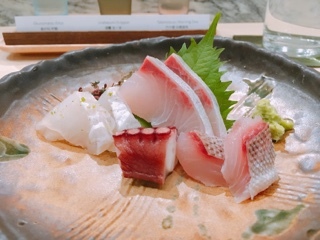 The first bite of the intertwined slices of Japanese seabass (Suzuki) showcases Shoushin’s rice at its finest – warm, vinegary and a creamy consistency. 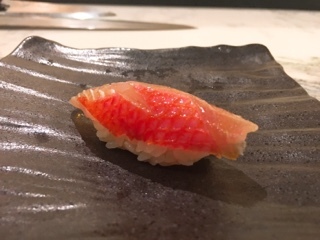 Although still good, the golden eye snapper (kinmedai) marinated in kelp would be even better if the skin was removed as I found it made the sushi chewy. Chef Lin was quick to clarify that the next piece, butterfish (ibodai), was the real deal and not the manufactured escolar found in budget restaurants. Intrigued to try the real thing, I forgot to take a picture, but found that it was not buttery, rather having a light mellow finish. 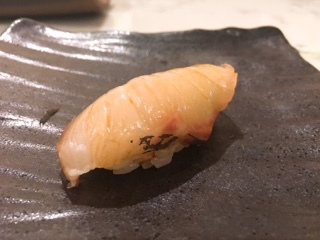 If anything, the striped jack (shima aji) should be renamed butterfish as it simply melted and was absolutely delicious for such an unassuming looking fish. 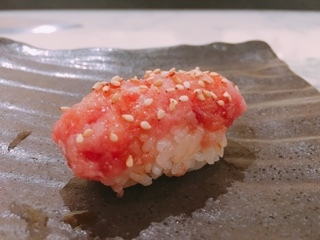 Shoushin’s tunas are out of this world in terms of creaminess: the lean cut (akami maguro) was velvety and flavourful; the medium (chutoro maguro) was equally luscious. By the time the fatty tuna (otoro maguro) arrived, I was expecting butter heaven. Interestingly, the otoro was scraped into a paste and topped with sesame seeds, but was served a tad too cold so the fish’s oiliness and rich taste was rather muted. The most surprising piece had to be the mackerel (aji). 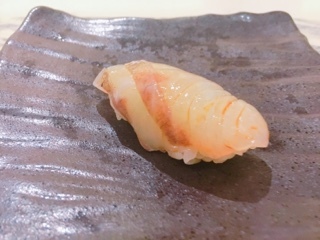 Despite not having a single green onion adorning the normally fishy sushi, Shoushin’s aji was clean and mild tasting, while still incorporating the meaty texture. 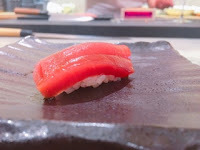 It’s easy to make tuna taste good, but to heighten the mackerel to that level was astounding. 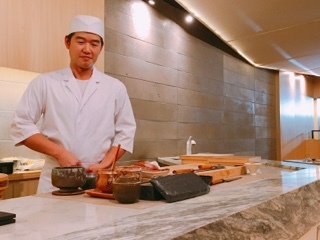 Like his mentor, Chef Seiichi Kashiwabara from Zen, Chef Jackie Lin keeps his sushi simple and instead relies on the quality of the ingredients to shine through. 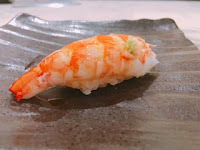 After having the Argentina shrimp (ebi), it seemed the sushi’s natural sweetness would have been a nice transition into dessert. 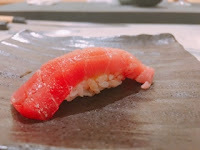 So, it was a bit unexpected that the following hand roll would incorporate such a strong smoked tuna. 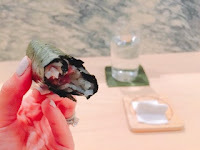 Yet, it all worked and Lin’s perfectionist side was highlighted again as he encouraged us to eat it right away before the ultra-crispy nori became tough. 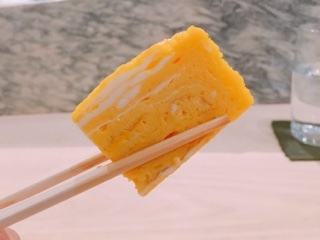 The customary sweet omelette (tamago) signaled the end of the sushi. Dense and incorporating a strong eggy aroma, I loved that you could see the layers of egg white and yolk to give it interest. Normally, the desserts at upscale sushi restaurants are forgettable … assuming anything is even served. 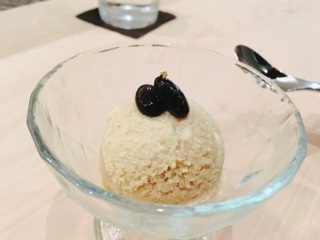 At Shoushin they have the customary ice cream – a house made roasted green tea version that’s okay but too icy. 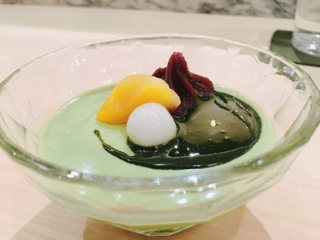 The matcha pudding, on the other hand, is fantastic with the smooth crème caramel like base, topped with sweet red bean paste, a chewy glutinous rice ball, apricot and an extremely strong matcha sauce. The dessert was delicious and different, a very satisfying end to the meal. Although each menu can be accompanied with sake pairings, we found it’d be too much. 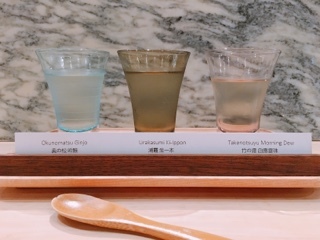 Instead, the sake flight ($18) was the perfect amount – just enough to sip and try with the different foods. Overall, the dinner at Shoushin was impressive. Having already accomplished so much for a young chef, Chef Lin continues to strive to for perfection. When my husband commented on how delicious the rice was, our waitress passed along the compliment to Lin. His immediate reaction, without a smile, “It could be better” and went on to explain how the rice in Japan is aged for a year. Make sure to get a seat at the sushi bar, it’s a wonderful opportunity to see the chefs at work and speak to Lin who divides his attention amongst everyone. Despite his serious nature, he even cracks jokes - after I commended the clean tasting aji, he kidded that he cleans it more than himself … immediately the entire bar erupts with laughter. What a surprising delight: having started as a stern fancy meal, it leaves me with a homey feeling and a full belly.